Size of this preview: 772 × 599 pixels. Other resolutions: 309 × 240 pixels | 618 × 480 pixels | 773 × 600 pixels | 989 × 768 pixels | 1,280 × 994 pixels. 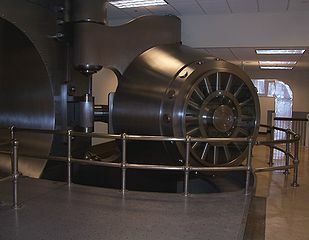 The door of the vault in the basement of the Federal Reserve Bank of Cleveland. This is the largest vault door in the world, weighing 91 tons. It is so precisely balanced that it can be closed by a single person. English: I took this picture on en:August 11, 2006 on my last day of interning at the en:Federal Reserve Bank of Cleveland. This work is licensed under the Creative Commons Attribution 2.5 License. This page was last modified on 21 April 2012, at 16:36. This page has been accessed 11,130 times.